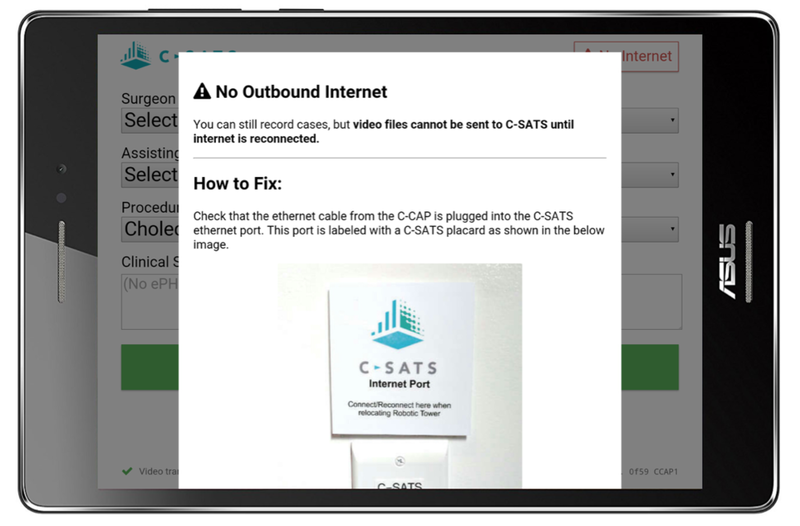 C-CAP provides clients with an easy, turn-key solution to record and send robotic cases to C-SATS. Please contact us for technical specifications and requirements or call us at 888-630-9748 for support. 1) Obtain the surgeon's permission before recording the case. 2) Select the Surgeon Name and Procedure* for the drop down menu and click Start on the bottom of the screen. *Please note that the Surgeon Name and Procedure are required before starting the recording. The Co-Surgeon and Case Notes are optional fields. If you are UNABLE TO FIND THE RIGHT SURGEON OR PROCEDURE IN THE DROP-DOWN MENU: Select "Other" from the surgeon list and type in the surgeon's name. 3) You will see a red banner at the top of the screen and a video preview in the middle of the screen when the case is recording*. To stop the recording, click Stop at the bottom of the screen. *If the video preview is blank and the procedure is underway, please refer to the troubleshooting section down below. 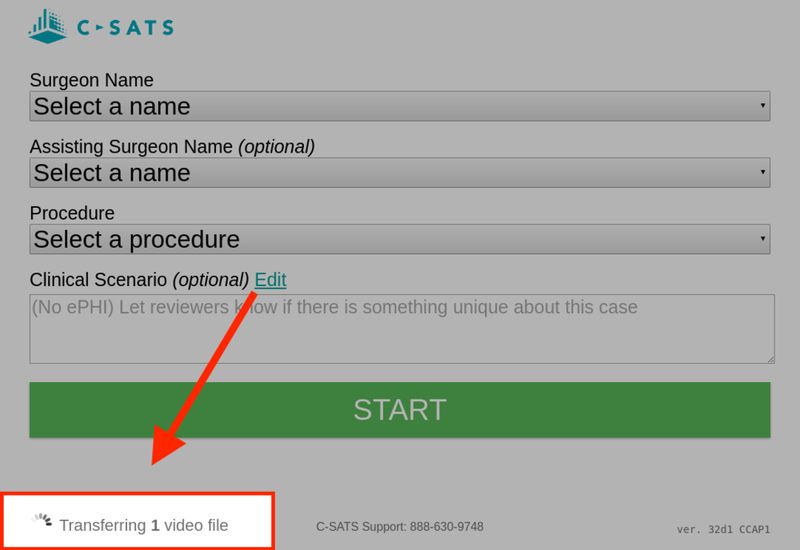 4) After stopping the recording, select either "Save & Assess" OR "Do not assess". You also have the option of adding any unique notes specific to the case that do not include any PHI. Save & Assess: The video will be saved to the surgeon's online library and assessed. If you selected Save & Assess, than the video recording and transferring process is complete. You will then see an icon indicating that the video is being transferred. Please wait until the "Video transfers complete" message is displayed before powering off. Do Not Assess: The video will be omitted from assessment and you can proceed to step #5. Archive: The video will be saved to the surgeon's online library and omitted from assessment. Delete: The video will be deleted. Note: If you accidentally hit delete, you will have 5 seconds to reverse your selection by hitting the "Cancel" button. Unable to find the right surgeon or procedure in the drop down menu. Select "Other" from the surgeon list and type in the surgeon's name. 1. Ensure the tower and power strips are plugged in, and that the robotic tower (vision cart) is powered on. If the tablet is asleep, press the power button for 1 second. If the tablet is turned off, hold the power button for 6 seconds and release. After a few seconds, the screen will turn on. NOTE - if the battery is completely depleted, allow the tablet to charge for 10 minutes before turning on. Press the home button on the tablet. 1. Ensure the C-CAP device is plugged in (see label #1 on image). The C-CAP is typically located behind the robotic console or at the bottom of the robotic tower. 2. Ensure the ethernet cord is plugged in and that the two indicator lights are on (see label #2 on image). The indicator lights can be either constant or blinking. 3. If both cords are plugged in and the tablet is still offline, press the power button one time to turn off C-CAP. Once the device is powered down, press the power again to turn it back on. If the problem still persists, please reach out to C-SATS support at 888-630-9748. Tablet provides a "no video source detected!" alert at the top of the screen. This alert is typically shown when the video capturing device has been unplugged from the C-CAP. As the alert mentions, please ensure the BLUE cable is plugged into both the C-CAP and the Video Capture device. The video preview will only show up after you click "Start". If the preview is still not showing up and the recording is taking place, please take the following steps. 1. Locate the C-CAP device, which is typically behind the robotic console or at the base of the robotic tower. 2. Ensure the USB cord is plugged into the back of the device. 3. Check to make sure the Magewell video capture device is plugged in at both ends. 4. Confirm the DVI cord is plugged into the back of the robotic console. In this case, it's likely the videos are recording to C-CAP but not transferring to C-SATS. Please contact C-SATS support at 888-630-9748.